Sen. John McCain (R-Ariz.) told The Hill hed be glad to try to help out Florida Gov. Charlie Crist (R) in his Senate race but he hasnt been asked. Crist is in a tough primary battle with former state House Speaker Marco Rubio (R) for the states open Senate seat. Sure, Id be glad to try to help him, McCain said in an interview with The Hill Wednesday but added Crist hasnt yet asked for his help. 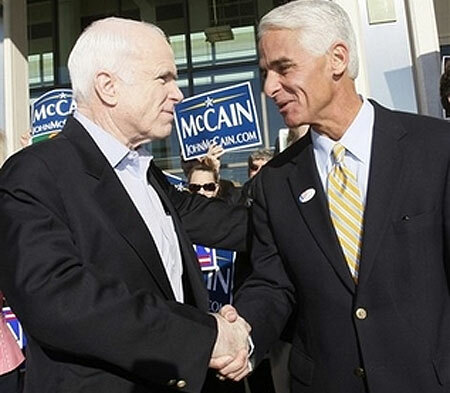 Crist and then-Sen. Mel Martinez (R) gave McCain a critical endorsement in the waning days of Floridas GOP presidential primary in 2008 that helped McCain win the Republican nomination. For McCains assessment of his own Senate primary and his reaction to Mitt Romneys endorsement, check out The Hills interview with the senator. Maybe Charlie Loafers can campaign for you too, McCain. Toss in Mitt, T-Paw and Slick Perry and you guys can travel the country together and sell amnesty as the solution. After all, it only has a 2 trillion price tag. When are people going to get it? One of the main enemy of the Tea Party foundation and what it stands for is John McCain. Time to take him out with this election! I do not care WHO supports him!!!!!!!! Awww, RINOS rubbing horns, how cute! Maybe Obama could team up with McCain in a bi-partisan show of support.. After all Charlie’s a bi sort of guy. Taking McCain out is probably the most important goal this primary season. Nothing could further the cause of conservatism more effectively. "Why doesnt this surprise me?" I thought the same thing - that is who he is and he doesn't really try to hide it. I'll bet Sarah Palin wishes she never made that pledge to help McCain - she'll keep her promise 'cause that's who she is, but this will be tricky for her. The Failure is going to help The Loser? Come on down to Florida Juan so I can protest both you RINO turds at one place and one time. We also need fat Newt to show up. Newt did such a great job up in NY-23. I like Hannity, I think he is a nice guy. He needs to stop having that idiot Newt on. Juan McCain and Charlene Crist have to go. Yep! From RINO to RINO!! Get those RINOS OUT! Time to clean the slate! In this state Charlie’s only chance is to run as a Democrat or an Independent. No conservative would ever vote for him. No self respecting conservative would ever vote for McCain, either. No wonder the Liberals are claiming there is no difference in the parties with guys like Crist, McCain, Mitt, etc representing the Republican party. The Republican leadership doesn’t get it. With their stable of RINOs constantly on display, why would the public vote for a weak imitation of the liberal philosophy when they can vote for the real thing. OH how I hope McCain DOES go down to Florida and attempt to “HELP” Charlie! That would be a DREAM come true for Marco and the Tea Party patriots!!! Has Sarah done any active campaigning for McCain? Does she plan too? I haven’t heard much beyond the endorsement. "Why can't I quit you?!?"